RANTWICK - Commuter Cycling in London Ontario | A Bike Blog: Well Go and Figure: I Like Strava! Well Go and Figure: I Like Strava! I really like reading bikesnobnyc, and bikesnobnyc really likes poking fun at roadies who obsess over all the latest tech and bikes and training stuff. One way in which some people do this is something called Strava. Snob pokes fun at it too, which made me somewhat reluctant to try it, I must admit. Sad as some (including the bikesnob) may find it, I hold the bike snob in pretty high regard. Strava allows cyclists and runners and swimmers (tri-geeks or mono-geeks) to track their workouts' paths, speeds and distances via gps and also uses any extra info the person's electronics may offer, like heart rate and power meter readings. Caring about that stuff or buying all the latest tech is not really my deal, but way back when I had a basic cycling computer that measured distance and speed, I really liked it. Too much. That little device on my handlebars became quite a distraction and I started to spend too much time watching it and trying to beat previous top speeds, best times and so on. I was getting all OCD about the little screen readings and missing out on the best parts of cycling: fresh air, sunshine, trees, people... you know, the outdoor world in all its fine variety; the whir of the drivetrain, the thrill of speeding along with the wind rushing in your ears. I wasn't cool with that situation and ditched the computer and have been pleased with that decision ever since. I missed having a tally of my miles because it helps me stay on top of maintenance tasks like chain replacements, knowing how many miles a set of tires had lasted, etc. Other than that, it was good riddance to the computer, especially since I had mastered manual cadence computation. I forget what made me curious about Strava. In any case, I decided to try it. I don't spend money on high-end cycling stuff, tech included. However, I do own a smartphone and there's a free Strava app to track my rides with. Knowing the pitfalls of handlebar mounted tech, I just start the app, stick the phone in my fanny pack and enjoy my ride. When I'm finished, I just stop recording and upload the activity and I'm done. Activity tracked, ride enjoyed unimpeded by OCD statistics watching. It's the best of both worlds! Strava is also a platform for people to compete, trying to go fastest on "segments" identified by riders. Common cycling routes usually have lots of segments on them that have been defined by Strava users. Climbs are very popular segments. The person with the fastest time is referred to as "King of the Mountain" and their achievement is thus called a KOM. 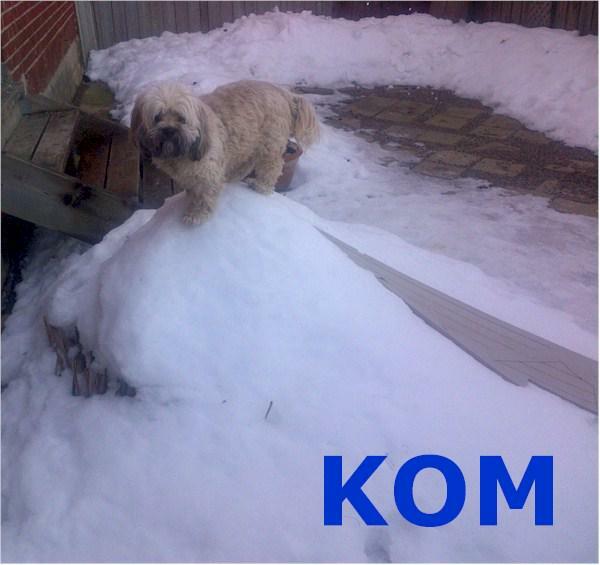 My dog Snow Face is about as close as I'll ever get to a KOM, since we're talking about some of the most fit riders in town riding racing bikes vs. a middle aged overweight man on a heavy commuter bike. That said, Strava allows me to compete with myself, letting me know when I've put in a good effort or a personal best (PB) on a segment. After a brief spate of segment-chasing and over-exertion (a common problem among Strava users because it is kind of addictive) I have chilled out. It's nice to see segment info from a ride, but I no longer seek it actively. On routes I ride often, I know where the segments are and attack them hard some days and ignore them completely on others. It should be noted that Strava has been criticized for inducing some unsafe riding by idiots chasing KOMs... I believe it. If you're gonna try it, please don't be one of those. Being a cycling nerd is completely forgivable, but putting others at risk so you can play speed racer is not. I am finding Strava fun and encouraging and best of all my cycling stats OCD is relegated to times that I'm OFF the bike rather than ruining my time ON it. I think the lesson here is that you don't have to be Kaptain KOM to enjoy using Strava, nor do you have to geek out watching tech strapped to your handlebars. Go and figure, I like Strava! Being a devoted follower of BSNYC, I would ask you to keep this under your hat, OK? Don't worry Rantwick. your little secret is safe with me. While I don't geek out too terribly over the data it's something I've always been interested in. I've been keeping an "analog" paper ride log since 2004. I have every ride recorded including bike, weather, route, distance, and average speed. Over 8,000 miles worth. On second thought I guess I do geek out pretty obsessively. Last year I started using a smart phone app called endomondo. It's basically the same as strava but it has categories for other activities like hiking, horseback riding, snowshing, skiing etc. Like you I like the set and forget part of it. Put the phone away in the pack and enjoy the ride! One part of the tech I do enjoy during the ride is the female robot voice that comes on and announces lap times or mile pace as I ride. On the recumbent my pack is on the back of my seat so I can hear the data fine even while underway. Oh yeah come over to my blog and check out my new rack and panniers when you have a chance. You were instrumental in my decision making process. Thanks Rantwick! I won't say a word...not a word! I've kept a training diary continuously since 1988. It was sporadic from 1980 to 1988, but in '88 I decided to write something every day as my BS detector in case I felt like I was training like a real racer. I included any sort of exercise I might have gotten. For instance, when I lived on a farm for a while and had to milk cows some of the time, my hand and forearm strength increased, so my rock climbing improved. cutting, splitting and stacking firewood counts, too. But even if I do nothing on a given day, I write it down so I have to see the gaps as well as the achievements. Transferring info from the bike computer does take time. Not a lot of time, but it's not automatic like a smart phone app. If you find a system that works for you, appreciate it. Strava braggarts are still laughable, but not every Strava user fits that description. I too find the data that Strava pumps out at me rather fascinating. And a slow as I am, I find it sad that I have two QOMs: "Really ladies? I'm the fastest on this segment? Oh, wait... I'm the only woman who's Strava'ed up this hill... THAT'S why I have this QOM..."
RCT - Checked out your pannier and rack setup on your blog and left a comment, A very positive comment. Trevor - Thanks for your discretion in this matter. Cafiend - "A" for initiative with your paper log. I was unwilling to be active enough to even log my activity or lack of it until it became this scary easy. Mmm. Lazy. John - I assume you're the John who is giving me kudos on Strava all the time... thanks! Red - Cherish those QOMs. Some rabid segment chasing freak will be after you soon enough. Welcome to the Strava-sphere! I enjoy it, too, not least because of the people I've met all round the world. The social aspect is very supportive. Are you registered as Rantwick? Please do follow me @babble on, and I will follow you back. RCT - Strava tracks all sorts of activities, too. I tried Map My Ride (also called Map My Run) but it wasn't nearly as accurate, and often I would do a ride but for some reason it wouldn't record. Other than that, I think that most of the apps have similar features, except Strava is by far and away the most widely used of them, so there are more segments, and more people competing for them! Rusty Red - lol! I hear you! As a girl who simply can't climb, I am always surprised when I win those cute little crowns on a hill. But then half the time, it's cause a lot of women simply won't attempt that climb. It's easier to win QOM's all round, cause there are just so many more men on the roads, but that's a reflection of the disparity between the sexes in every aspect of cycling, I suppose. But we're getting there! I have used Strava once or twice before as an App. Don't use much of any of those apps no more, but I do use my Garmin for mileage, which I look at about once a year. And, I am waiting for my Hammerhead Navigation - hopefully it will ship this year.